there are a ton of stories like this…. And there will probably be more. We should remember these people in our prayers. I can’t imagine what they are going through. I had heard there were fires in Australia, but hadn’t read too much about them. This morning, the Telegraph had a collection of pictures from there about the fires. They led with the picture below. 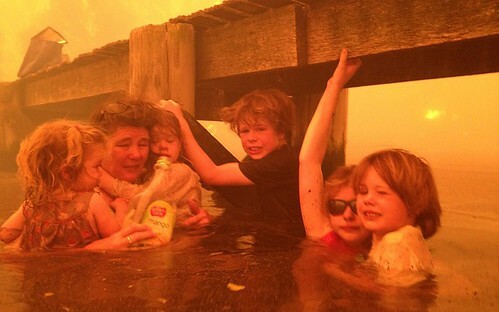 A set of grandparents saved their grandkids by fleeing the fire into the (ocean, sea, lake…it isn’t clear) and sheltering under the dock. We should remember to pray for the people of Australia affected by the fires. What a way to spend Christmas evening…at the a&e (that’s what they call the emergency room in England). Why am I here? Well Cyndi wanted a food processor. I got her one. Themetal blade was in this plastic case tthing. What a stupid idea I said. 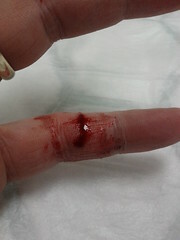 Well, as was washing it I sliced my finger… quite nicely. So Cyndi said I should come. So…here I sit on Christmas eve waiting to be seen. [Update 2012-12-25 21:53:37] It took about an hour to get seen. And what did they do? Put some tape on it and give me a sling. A sling! I wanted to ask how I was supposed to drive home. On one hand, in the states, I would have wanted more for my $100 ER fee. My first reaction is to say I’m glad I didn’t pay. Then, I remembered the OUTRAGEOUS amount of income taxes I paid here to provide this “free” healthcare. I want more for my thousands! Oh, I also added the picture. Click it if you want to see it in more detail. our language teacher, her family, and her grandpa. Her grandpa isn’t doing well and is in the hospital. She asked us yesterday if we could move our class one hour later this week. She hasn’t said it this way, but I can only imagine how stressfull this is for her and her family. I don’t know how to tell you to pray. Pray as the Spirit leads for this man, our teacher, and their family. Also pray that we would know how to respond in the correct ways. I know this was late; however, I didn’t get a chance to blog yesterday. We need to remember the faculty, staff, and students at Virginia Tech in prayer. We need to pray that the Christians on campus would be able to witness to their unsaved friends. We need to pray for the families of the students involved. Richard, a guy I go to church with, and I went out witnessing this afternoon. We met a guy named Adam. From what I can tell, he isn't saved; however, went to church in the past. He sounded as if he had the truth at one time, but has turned away. Pray for Adam and his salvation. Serbia. What is the first thing that comes to your mind when you hear the name of our country: Wars, the dictatorship of Milosevic, isolation, banishment, humiliation, shame? Serbia. The forgotten country of the Balkans which needs help in prayer and spiritual warfare to break the darkness that hangs over her, to start mending the wounds of the wars, and so that the grace of God would pour out abundantly and the kingdom of God would take a significant place in our country. [Update 2012-12-26 12:40:40] The links to the pray4serbs website were broken and I couldn’t find the article again. Pray for them. They both have colds. [Update 2012-12-26 15:05:52] The link to the LMCO was wrong. I updated it. Hey all…remember to pray for Deneise (sp?). Cyndi and I had to get new tires on the car today and while we were waiting for the car to get done, we went to the mall. While at the mall, we went to the calendar store. While there, the lady working struck up a conversation. Well, eventually, she mentioned God, etc… so I took the opportunity to start witnessing to her. We just got going in the conversation when she had to turn her attention to a customer (there was no one else in the store when she started talking) who had walked in. Afterwards, we never did get to return, but I gave her a tract before we left. She appeared to be seeking something….Remember her in your prayers and ask God to reveal Himself to her.